To help make sense of it all, we've pulled together a quick primer for you to better understand four common types of data and how they can be leveraged to improve marketing outcomes. Let’s start with the most common type of data – the data that you likely have in your databases on current and prospect customers. Demographic data is the most well-known type of data. It refers to how we look at and break populations down by age groups, gender, ethnicity, geographic regions, income brackets, etc. 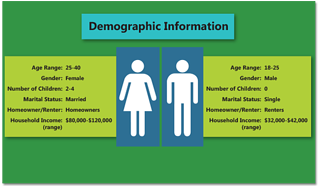 Demographic data can tell you a lot about your audience at the surface level. Often, it’s the first set of data that marketers look at because it’s quantifiable and statistically sound. And by this I mean that this type of data is numbers and facts based, such as a census vs. based on opinion. It’s also what most of us have on hand or can easily attain through simple research or a data append. Demographic data can often be used to inform targeting. For example, one of our clients wanted to leverage social channels to reach their target audience, specifically Facebook. In order to make the most of their social media dollars we recommended using demographic data that had been collected through customer surveys to select the right criteria to reach their ideal audience: age, gender and geography. While this might seem like basic information, focusing on a more targeted group leveraged their media budget dollars more wisely vs. blanket advertising to everyone. To dive in a little bit deeper, the second and third most commonly used types of data are psychographic and attitudinal data. This data can be more subjective, because it gets at feelings, beliefs, opinions, lifestyle traits, and interests. Layering psychographic and attitudinal data onto demographic data gives marketers a richer, more holistic view into their customers and prospects. Psychographic data allows us to look at people’s personalities, their values and opinions, their interests, and what their lifestyles are like. Attitudinal data allows us to better understand what consumers attitudes are, for example, toward specific company and product attributes. It also allows us to understand what motivates them to purchase and what they like or do not like. Leveraging psychographic and attitudinal data about current customers provides you with the ability to build models based on known attributes of your customers. For example, a look-a-like model can be built by identifying key attributes among current customers and then run against a prospect list to identify prospects with matching attributes to your current customers. Building models based on data is often a proven way to ensure you’re going after the right audience and not wasting marketing dollars on communicating with people who are unlikely to engage with you. However, it’s important to validate the model by testing, especially if you haven’t used models before. Additionally, the psychographic and attitudinal insights can help inform tone of message as you’re often gaining perspective into how people feel towards products and services and what their opinions are. 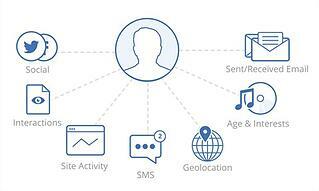 Finally, you can also apply behavioral data, which looks at consumers’ behaviors. This is the most valuable because it’s highly actionable. Behavioral data is primarily gathered based on digital behavior, such as site visits, online purchases, cart abandonment, online searches, etc. With all the data that is now collected digitally, marketers and third party data sources are now able to determine interests, motivations, and spending behavior, simply by looking at how consumers are engaging with online content. These insights can help marketers predict who might be the right fit for their product or service based on past online behavior and also the right time to target. The use of behavioral data allows for us to not only target the right person with the right message, but we now can target them at the right time in the buying journey. 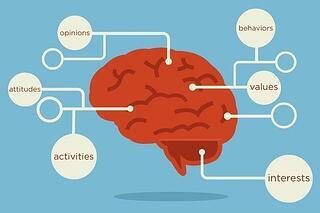 You might now be thinking, as a marketer how can I use all of this information? The following example should help bring this all to life. Develop communications that leverage the insights from our data analysis of our customers which would then more deeply resonate with our prospects. Ultimately leading to smarter use of marketing budgets and an improved ROMI.